I went to my Mom’s and forgot to bring this along to show her. This is the first of four aprons that I cut out this week. I’m calling this one the “cowboy apron” for obvious reasons. 😉 My Mom had this fabric and it worked out perfectly for this apron style. I really like the hostess apron (half apron) style for fun, bold or holiday prints. I learned a few things from doing this one. For example, I’ll be attaching the pockets just a little differently on the next apron. I also learned that each apron will take two packages of ric rac, but that the ric rac really adds a cute touch! Sew cute, I especially love the ric rac at the bottom! Very cute Apron! 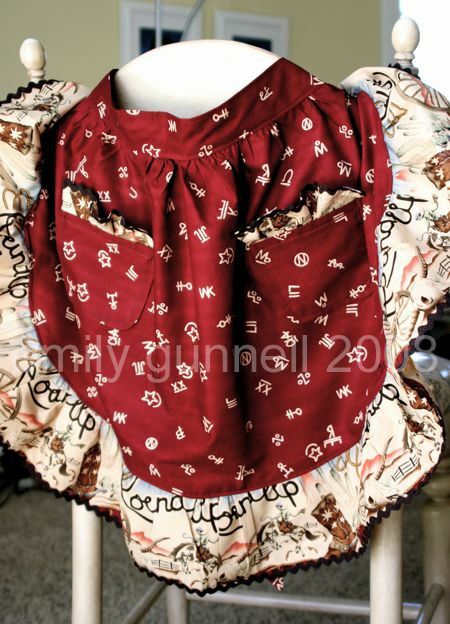 I like the extra detail of ruffle on the pocket too! Now that I see the pattern, I am going to go shopping for more fun fabric! Adorable Emily! I just bought a cute apron on vacation. You could start a new business!!! Hey Pixie – I love the apron. I can’t wait to see more of them. You might want to check with Joy cause I think she has a source for spools of ric rac. OMG! Those are all adorable!! I Love them!